1. Preheat the oven to 175C. Unwrap Camembert from its packagings and leave Camembert in a box. Score the top of the cheese and sprinkle with olive oil. Bake for 15 minutes until its golden and soft. 2. Meanwhile cook the apples. Wash, and cut the apples into thin slices. Melt the butter in the pan and sprinkle with the sugar. Stir constantly until sugar is melted. 3. Add the apples and stir. Cook for about 1-2 minutes or until apples are soft and beautiful golden colour. 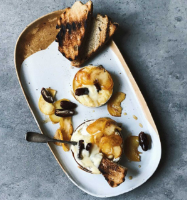 4.Top Camembert with the caramelised apples and sprinkle with the dates. Serve warm with fresh bread.